Twelve years ago, in February of 1996, Happening People made its debut as a column in the Eugene Weekly. 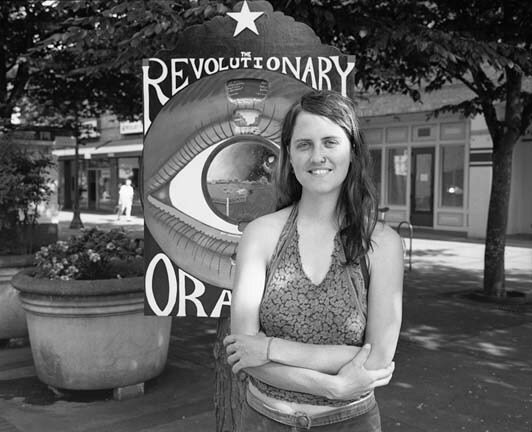 This photograph of artist Kari Johnson, with her sculpture The Revolutionary Oracle, appeared a few months later, in June of 1996. The Oracle was one of seven pieces included in that summer's Outside Art exhibit in downtown Eugene. As of February 2008, 670 individuals and groups, all of them nominated by readers of the Weekly, have been featured as Happening People. Beginning this Friday, February 22, and continuing through March 29, a selection of portraits from the HP archives will be on display in the Jacobs Gallery at the Hult Center for the Performing Arts. The exhibit, titled Telling Stories, also includes large-format photographs of the disappearing traces of man in the wild areas of Oregon, from tidewaters to high desert, by Corvallis photographer Rich Bergeman. An opening reception is scheduled for February 22, 5:30 - 8:30 pm. Past, present, and future happening people are cordially invited to attend.